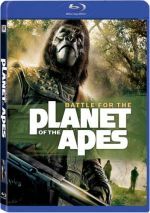 After the collapse of human civilization, a community of intelligent apes lives in harmony with a group of humans, but a community of mutants who reside beneath a destroyed city try to conquer those whom they perceive as enemies. When 1972’s Conquest of the Planet of the Apes concluded, it left the Earth in turmoil. Led by simian Caesar (Roddy McDowall), the apes revolted against their human oppressors. 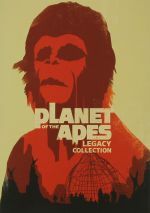 Based on its title, you might expect that 1973’s Battle for the Planet of the Apes picks up right at the conclusion of its predecessor. However, you’d assume incorrectly, as it actually leaps forward a few years. We discover that man and ape fought a horrible war that left the Earth devastated. Caesar desires a society in which both sides can co-exist, so he runs a little commune where he attempts to achieve those goals. However, not all goes smoothly. As exemplified by General Aldo (Claude Akins), the gorillas don’t like this hippie lifestyle and want to fight. They resent the humans and want to be firmly in charge, so this seems like it’ll inevitably lead to conflict. In the meantime, Caesar’s human counterpart MacDonald (Austin Stoker) tells him they could find evidence of the Earth’s future in a decimated, radioactive city. Since these recordings show Caesar’s long-dead parents, he wants to see them. Along with resident intellectual orangutan Virgil (Paul Williams), they launch an expedition to retrieve these artifacts. When they arrive there, we discover that some humans survive in the radiation. Led by Governor Kolp (Severn Darden), their forces pursue our crew. MacDonald and the apes escape but Kolp sends his soldiers to “exterminate” them. The movie follows the assault by Kolp and his men as well as internal struggles related to the militaristic Aldo. Battle seems to be the most reviled of the original Apes series. Perhaps the 10 minutes added to this extended cut improved it, or maybe I just expected so little that it couldn’t help but be better than anticipated. Whatever the case, I didn’t find it to offer a poor experience. Not that I’d refer to Battle as a great movie, as it comes across as watchable but forgettable and also something of a missed opportunity. I can’t help but think a film about the cataclysmic war would have been more interesting than this look at the aftermath. I expect the film’s budget had a lot to do with this situation, as a massive conflict would be much more expensive than the limited scope of this movie’s story. Nonetheless, the bigger canvas would have been more interesting. Battle also might have been more compelling without the elements related to the mutated humans, as they exist for little reason other than to show warfare. The movie could have pursued the internal conflicts between gorillas, chimps and humans to better effect. Yeah, those elements play a role, but they get lost among Kolp and his mutants. Coulda, woulda, shoulda – all of that becomes irrelevant, I suppose. The final result on the screen doesn’t fail, but it doesn’t soar either. The best parts of Battle come toward the end. Some elements of the mutant/ape fight are good, and a final confrontation between Caesar and Aldo also has its elements. I could live without the “view from the future” offered by an out-of-place John Huston as the Lawgiver, though, and the whole ending seems too PC to be palatable. All of this leaves Battle as a resolutely mediocre Apes flick. There’s enough of interest to keep the viewer reasonably involved, but there’s not enough to make the movie memorable or special. It closes the series on a flat note. 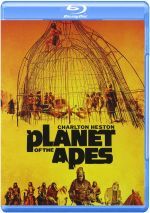 Battle for the Planet of the Apes appears in an aspect ratio of approximately 2.35:1 on this Blu-ray Disc. After a slightly rocky start, the image became quite good. Overall sharpness was good. Some shots could be a bit soft – especially during the opening - and some interiors lacked great resolution, but those weren’t frequent distractions. The majority of the movie showed nice clarity and accuracy. I saw no examples of shimmering or jagged edges, and edge haloes created no problems. I also failed to witness any print flaws. Colors looked fine. The film tended toward somewhat muted tones but they were fairly natural and showed good range. Blacks seemed deep and firm, and I thought low-light shots delivered reasonable clarity. This ended up as a satisfactory presentation. While the DTS-HD MA 5.1 soundtrack seemed moderately above average for its era, it showed its age a little more than I’d like. The main problems stemmed from the quality of the audio. Speech always remained intelligible, but the lines occasionally sounded a bit edgy and hollow. Effects also demonstrated a little distortion, though they mostly displayed decent accuracy and range. Music was the best part of the track. The cues sometimes were a bit shrill, but they mostly came across as acceptably full and lively. The soundfield worked okay, though it could be a little erratic. At times, the mix tended to steer right; I occasionally wondered if something was wrong with my front left speaker, as I didn’t hear much from it. Balance improved as the movie proceeded, though, and the mix usually delivered a decent sense of place. The score spread across the channels fairly well and the whole package used the back channels in a moderately engaging manner. Nothing here dazzled, but this was an acceptable mix for a more than 40-year-old movie. How did the Blu-ray compare to the prior DVD from 2006? Audio was a little better developed, as I thought the soundfield showed better balance. Visuals seemed tighter and cleaner as well. The old DVD was nice, but the Blu-ray provided improvements. While the DVD included virtually no extras, the Blu-ray provides a few components. Of most interest to fans, the disc boasts both the film’s theatrical version (1:26:32) and an extended cut (1:36:26). The prior DVD featured only the longer edition, and that’s the one I watched, so I can’t comment on the changes personally. However, I checked elsewhere and it appears that most of the additions come from extensions to existing scenes. The main new sequences revolve around a nuclear weapon and its potential deployment. It’s good that viewers now have the choice between the two versions. Though we get no commentary, we do find an isolated score. This provides Leonard Rosenman’s work in all its DTS-HD MA 5.1 glory. Fans will enjoy this bonus. A featurette called End of an Epic: The Final Battle runs 16 minutes, 34 seconds and provides notes from Planet of the Apes Revisited author Joe Russo, Planet of the Apes As American Myth: Race, Politics and Popular Culture author Eric Greene, screenwriter Joyce Corrington, 20th Century Fox: A Corporate and Financial History author Aubrey Solomon, makeup effects artist Brian Penikas, cinematographer Richard Kline, and actors Noah Keen, Austin Stoker and Bobby Porter. The show looks at the film’s place in the series as well as story/character elements, aspects of its script and development, budgetary restrictions, crew and cast notes, action and stunts, and the franchise’s post-Battle prospects. The program covers a good mix of movie-related subjects and becomes an efficient overview. In addition to the film’s trailer, we find some Galleries. We locate “San Simian Sentinel” (four screens), “Interactive Pressbook” (7), “Advertising” (4) and “Behind the Scenes” (29). All are good, as they show a lot of interesting promotional material. The first two also let you take close-up views of text materials, which works well. The original Planet of the Apes series ended with Battle for the Planet of the Apes. The film wasn’t a soaring send-off, but it didn’t turn into a total dud either. The Blu-ray provides fairly good picture and audio along with a few decent supplements. I’m not wild about the film, but the Blu-ray treats it reasonably well.